In the early twentieth century, a secret cave, now known as the ‘Library Cave’, was discovered in the Buddhist Mogao cave complex (Mogaoku 莫高窟), just outside the Silk Road town of Dunhuang in northwest China. This cave had been sealed for a thousand years and contained around forty thousand manuscripts, paintings and printed documents on silk and paper. Among them, was a manuscript containing the oldest manuscript star atlas known today from any civilisation, probably dating from around AD 700. It shows a complete representation of the Chinese sky in 13 charts with over 1300 stars named and accurately presented. The chart contains much information that has proved very useful for modern astronomers. The Dunhuang Star Atlas was not the only astronomical document found in the Dunhuang Library Cave. Along with a fragment of a circumpolar star map and an astrological compilation of the Chinese constellations, the discovery of these documents revealed a fascinating snapshot of astronomical knowledge in ancient China. Its discovery was a huge surprise since such an early chart had never before been seen from any civilization. But the first mention of the chart in an astronomical context appears to be made by Joseph Needham as late as 1959 in his Science and Civilisation in China . The atlas itself forms the second part of a longer scroll (Or.8210/S.3326) that measures 210 cm long by 24.4 cm wide and is made of fine paper in thirteen separate panels. The first part of the scroll is a manual for divination based on the shape of clouds. The twelve charts showing different sections of the sky follow these. The stars are named and there is also explanatory text. The final chart is of the north-polar region. The chart is detailed, showing a total of 1345 stars in 257 clearly marked and named asterisms, or constellations, including all twenty-eight mansions. For a hand-drawn document the positioning is very accurate and stands up well to comparison with modern charts. Because astronomy was considered a matter of state, the distribution of documents like this would have been strictly controlled and limited to military and governmental use. This may explain why so few charts of this sort exist today. As Dunhuang, the place of discovery, is a remote town where it is unlikely astronomical observations would have been recorded, it seems likely that the chart was brought to Dunhuang by an official from the Chinese capital. The importance of the chart lies in both its accuracy and graphic quality. The chart includes both bright and faint stars, visible to the naked eye from north central China, and was probably used as a reference material. Its origins and real use remain unknown. The Dunhuang Star Atlas is now held at The British Library in London along with many other items from the Library Cave and other ancient Silk Road sites. These unique items tell fascinating stories of life on the Silk Road from 100 BC to AD 1400. Most of these collections were dispersed to institutions worldwide in the early twentieth century, making it difficult to study them as a whole. The International Dunhuang Project (IDP) based at the British Library is now making these resources freely accessible to all via this multi-lingual website. Read about in more detail about the Dunhuang Star Atlas on our research pages. The Dunhuang Star Atlas was drawn from accurate observation, but drawing maps can be a complicated process. Like the earth, the sky is not flat but a sphere. The sky we see above us is a dome. If it is cut into sections they will be both triangular, like the slices of a cake, and also curved. Map makers of both the earth and the sky had to find a way to show these sections on rectangular and flat surfaces, as on the Dunhuang chart. This process of converting, or projecting, points from a spherical object onto a flat piece of paper involves complicated mathematics and is known in map making as ‘projection’. Mercator projection of the Earth. Source image is from NASA's Earth Observatory Blue Marble series. 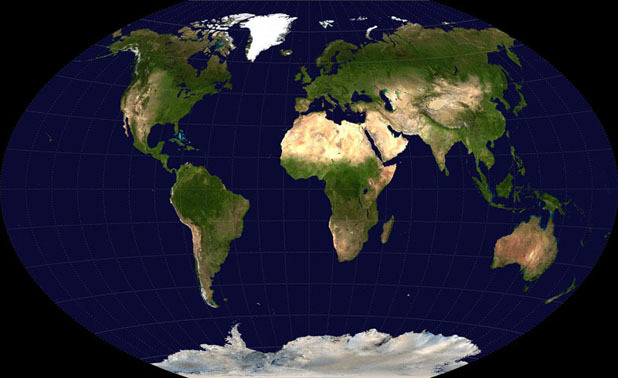 A Gall-Peters projection of the Earth. Source image is from NASA's Earth Observatory Blue Marble series. 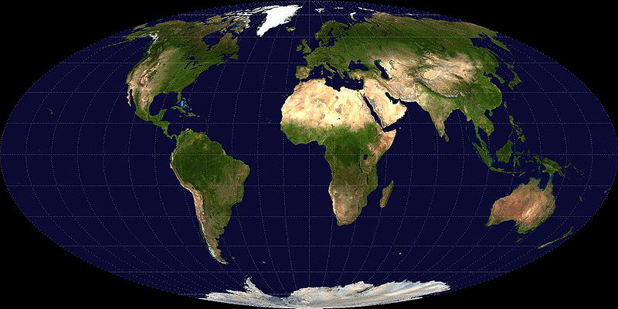 A Mollweide projection of the Earth. Source image is from NASA's Earth Observatory Blue Marble series. 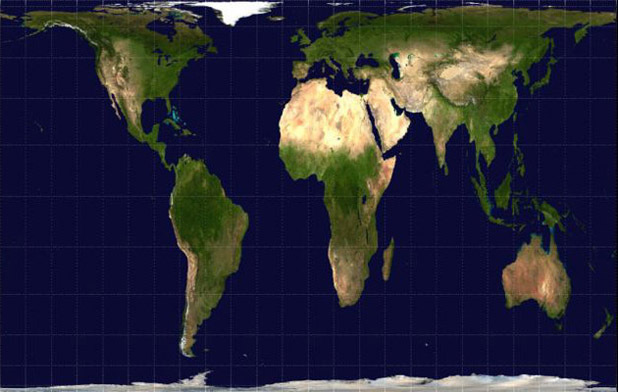 A Winkel Tripel projection of the Earth. Source image is from NASA's Earth Observatory Blue Marble series. 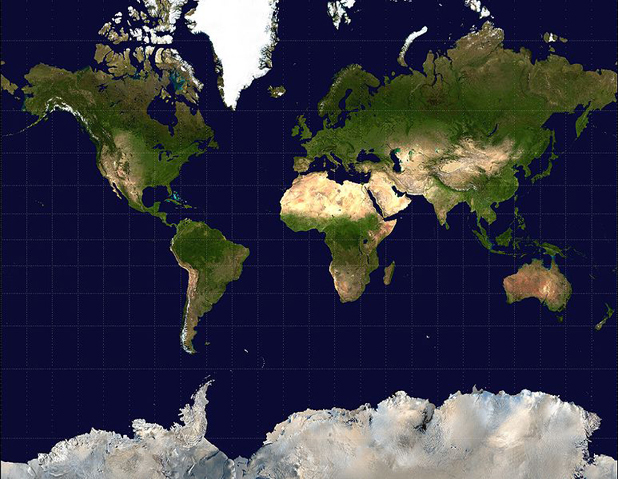 A Robinson projection of the Earth. Source image is from NASA's Earth Observatory Blue Marble series. 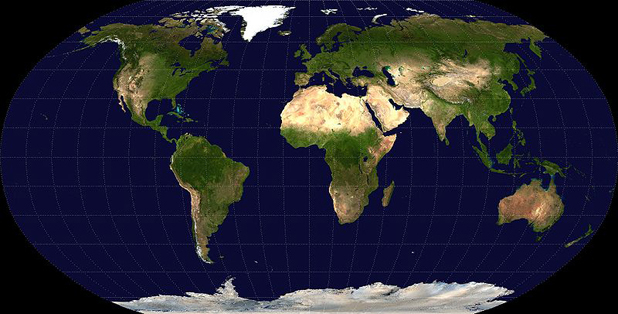 Familiarise yourself with the concept of projection by making your own flat map of the Earth. Visit the Classroom Ideas and Activities page to download instructions and images.